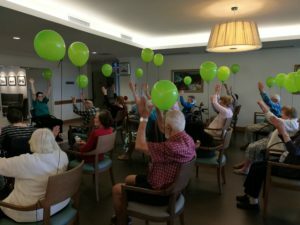 We talked to our onsite physiotherapists about what we can all do to improve our general wellbeing and even to reverse frailty as this is what reduces our ability to remain independent as we age. Having good mobility reduces your risk of falling. Did you know that most that as we age it becomes more difficult to step sideways or backwards?” Said Physio Yousef, Moran Roxburgh Park. At Moran Aged Care we’ve also got having a great diet and eating healthy food covered. Our Chefs prepare fresh, meals every day so our residents benefit from eating ingredients which help build their strength such as fruit, vegetables, proteins, good fats, whole grains and dairy products. Meals are eaten restaurant style, so they are a social occasion as well. We also know that taking medication properly and as prescribed is also important and our care staff assist residents with their medications. Being active maks you feel good our Lifestyle and Wellness programs are full of activities and excursions. Our physio and lifestyle team also work with residents staying with us for respite care, often these residents come to us after a fall or a hospital stay, and we assist them with regaining their mobility before they return home. For more information on Respite, Short Stay or Permanent Care please call 1300 544 944. Moran Kellyville, 35 Goodison Street – Tuesday 9th April from 10.00am – 11.30am, join us for a FREE over 65s Group Exercise Session (seated) followed by morning tea. The session will be taken by Physio Naazil and will focus on gentle exercise to help strengthen and condition muscle mass. Moran Sylvania, 29 Sylvania Road – Friday 12th April, 10am – 11am – Falls Prevention Workshop for residents and family members. The program will include strengthening exercises session hosted by Physio Dhan, discussion on the importance of hydration and good nutrition hosted by chef Carolyn and behaviour changes and associated risk of falling by Care Manager Lorraine. 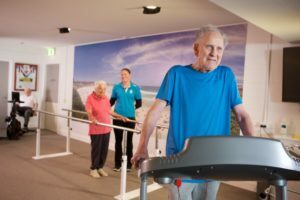 Moran Roxburgh Park, 3 Wedgewood Rd, Roxburgh Park, VIC – Wednesday 10th April, 2pm – Poor balance and strength affect mobility and put you at increased risk of a fall. There is good evidence that balance and strength exercises can reduce the risk of falling. Find out why FALLS happen and the importance of daily exercise/walking at a Falls Clinic especially for residents and family.